Woodward’s book is 177 pages of slanted recollections by an embittered Alexander Butterfield, the deputy assistant to President Richard Nixon who revealed the existence of the secret White House taping system. All the research, Woodward acknowledges in an “Author’s Personal Note,” was done by his long-time assistant. Whoever is responsible for the book, it is a petty torch job on the hated Nixon that liberals will love but future scholars will totally discount. The title ought to be Yet Another Disloyal Staff Assistant. Sixty-some former members of Nixon’s White House staff have held annual reunions for three decades, events to which Butterfield has never been invited. They are the last men standing. No doubt many of them could manipulate personal stories to make Nixon look bad, but they’ve never seen the need. But Butterfield has. When Nixon was elected in 1968, Butterfield was an air force colonel in a dead-end assignment in Australia. He had commanded a squadron of low-level reconnaissance aircraft (which Woodward re-characterizes as reconnaissance combat missions) and longed to command a fighter squadron. He had been at UCLA with H. R. Haldeman, the new president’s chief of staff, and their wives had been sorority sisters. Perhaps Haldeman could help him get reassigned. In a startling case of unexpected success, he became Haldeman’s deputy. Otherwise, Woodward would have us believe, Butterfield might eventually have become air force chief of staff. Woodward’s tale of Butterfield’s role is reminiscent of the story Ben and Me, in which a mouse named Amos explains how he helped Franklin to achieve his notable successes. Woodward assures us that Butterfield was Nixon’s Amos: the first to see the president in the morning, the last to see him at night. The truth is, Butterfield was a glorified paper-pusher, a highly-titled clerk whose main job was to secure Nixon’s signature on a multitude of papers already drafted and cleared by others. It was a procedural not a substantive job. Woodward cites not a single example of Butterfield’s contributing important policy analysis. On his first big day of responsibility, for example, with Haldeman called away, Butterfield interrupted Nixon’s meeting with his secretary of defense to raise a question about the appointment of a governor for the Virgin Islands. Nixon’s reaction to Butterfield’s witless intrusion was what you’d expect, but Butterfield never forgot the slight, coming back to it again and again in Woodward’s book. Far from a balanced retelling, The Last of the President’s Men devotes chapters to a single word, “zilch,” which is how Nixon had once characterized the results of the massive Vietnam bombing campaign. This was not an official finding or even a carefully thought-out conclusion. It was handwritten note, indicative of the frustration Nixon felt at a particular moment in his ongoing efforts to end the Vietnam War. But Woodward makes a federal case out of it, repeating the word no less than sixteen times in the next three chapters, and quoting North Vietnamese historical accounts as proof that the bombing made them stronger. After assuring us that Nixon’s chief legacies will be Watergate and Vietnam—somehow neglecting to mention his opening to China, détente and the first strategic arms limitation treaty with the Soviet Union, and the geopolitical realignment in the Middle East—Woodward sinks into the sort of petty drivel for which The Final Days is infamous. He gleefully recounts Butterfield’s story of Nixon’s eyeing a secretary’s legs and patting her knee in front of several staff members on a helicopter trip from Camp David. The suggestion is that this uncharacteristic episode (if even true) was the equivalent of the adulterous cavorting of Presidents Kennedy and Johnson. Woodward savors the account of the events culminating in Butterfield’s disclosure of the White House taping system in public testimony before the Ervin Committee on Monday, June 16, 1973. He makes it clear that Butterfield felt Nixon was guilty of a cover-up and foresaw that the system’s disclosure would bring down his presidency, even as Butterfield asserts his ambivalence. Perhaps most astonishing, he recounts how Butterfield privately spilled the beans to Ervin Committee staffers on a Friday afternoon but somehow didn’t get around to mentioning it to anyone at the White House until nine o’clock on Sunday evening—and only then at the urging of Senator Baker. It’s difficult to square Butterfield’s assertion that he wanted the truth to come out with his naive belief that the committee wouldn’t publicize his disclosure. Butterfield was more worried about a pending trip abroad than about the significance of what he was revealing. What he really wanted, he now says, is for someone else—preferably his boss, Bob Haldeman—to have been forced to make the public disclosure. In spite of Woodward’s extraordinarily gentle treatment of Butterfield, we are left wondering how such a naive and, frankly, rather dim individual became an aide to the president of the United States. A graduate of Harvard Law School, Geoff Shepard was a member of President Nixon’s White House staff from 1969 to 1974. 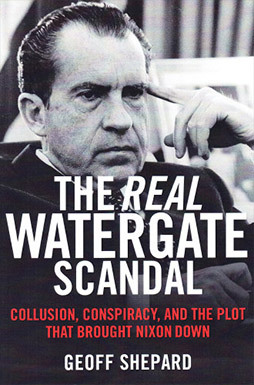 His book The Real Watergate Scandal: Collusion, Conspiracy and the Plot That Brought Nixon Down, was recently published. He can be reached at www.geoffshepard.com.